April Stearns with Nia, who turns 5 this year. 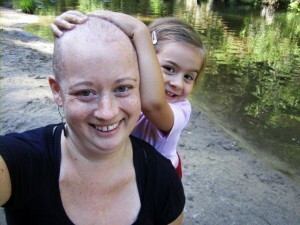 Parenting with Cancer: How did you tell your daughter that you had cancer? April Stearns: My daughter was still nursing to fall asleep at night when I was diagnosed. She had to wean for the initial MRI so I had to tell her something almost right away. She knew something was there in my breast, anyway, because the tumor was quite large and we both could feel it. She’d stopped wanting to nurse on that breast in the weeks before my diagnosis. So I told her that there was something growing in my breast called cancer. I told her that it couldn’t hurt her, but that it wasn’t good for me, so I was going to be having some really “big medicine.” She cried and cried and said she didn’t want me to die. She knew right away that it was serious, no matter how hard I tried to lessen the blow. We read a lot of picture books about mamas with cancer. That helped a lot, but also really brought the cancer home. April: My sister-in-law was amazing – from several states away she organized a food tree that had meals delivered to us during my chemo treatments (so, several months of meals!) and she organized a “play date tree” for the same time period. So while I was undergoing chemo, my little one was having play dates with trusted friends and relatives multiple times each week. That really helped me cope, to know that she was having fun and taken care of during my doctor appointments and while I was recuperating in bed. Later, my sister-in-law came and stayed with us for the two weeks immediately following my mastectomy. She was my daughter’s live-in nanny during that time, which was so helpful because then my husband could focus on helping me heal. It was so wonderful to have this kind of support, because the mastectomy was really hard on my daughter. She was angry and scared, and so it was wonderful for her to have a loving, present adult to be with. Also, my daughter could sleep with her aunt instead of trying to be in bed with me during that painful time post-surgery. April: Diagnosis doesn’t necessarily equal death. I know you want to just pull the covers over your head and cry in bed for a good long time, but for better or worse, you can’t do that with kids. Let them put a smile on your face. Let them keep you grounded and here now. April: Hats. Lots of hats. April: For a long time, my daughter told everyone she met that I had cancer: strangers at the park, clerks at the grocery store, other moms at the library. She needed to talk about it, and my husband and I never tried to censor her. It was interesting seeing the reactions she got, but she wasn’t looking for their sympathy. She simply needed to talk about it. Also, we did something called “Chemo Gifts.” Every week when I was in the Chemo Lounge getting a treatment, my daughter got a little present to help make the separation easier for her. These were little gifts: stickers, games, stuffed animals. Most of these gifts were sent to us to be squirreled away by loving relatives. It helped to put a positive spin on a really hard time. April: Two things: Will the cancer come back? And, will I be able to have a second child? I was diagnosed just as my husband and I had decided to go for baby #2. Because I was already Stage 3 when I was diagnosed, we didn’t have time to freeze my eggs or anything like that. 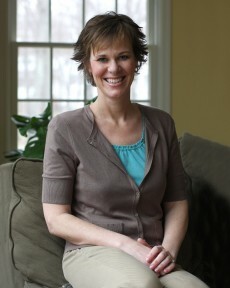 Chemo put me into premature – hopefully temporary – menopause. My periods have not yet returned, but I’m still in treatment. If my periods return, and the cancer stays away, we hope to try for a baby in a couple of years. My daughter asks all the time when she will have a baby brother or sister. April, that picture of you and Nia is beautiful. Your words of advice are a wonderful resource…thank you for sharing. Thank you for sharing your experience with us Nia…such great advice and tips. Your photo and your spirit are beautiful… Wishing you and your family much health and happiness for many years to come. Thanks for sharing and for your lovely words of advice! You are beautiful and strong.